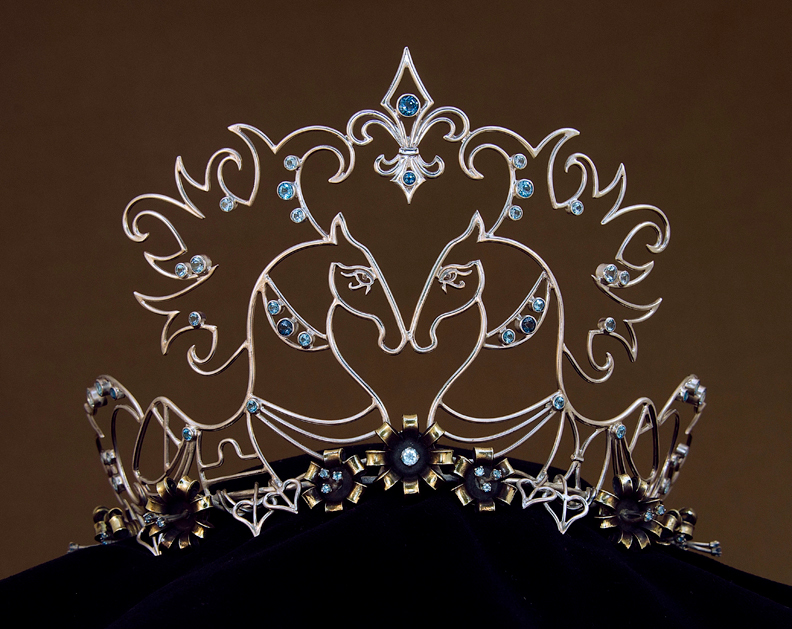 To read about tiara pictured, check out Custom Wedding Tiaras. Jeni will be happy to craft something unique especially for you! From small projects to elaborate creations covered in gemstones, with the proper time fame, Jeni can create the custom jewelry and artwork that you have in mind. Jeni utilizes two techniques for her designs. She can make models and molds for cast items or an individually crafted fabricated design. Both techniques are quite different. For small to medium sided projects, fabrication is normally less expensive. Fabricated custom jewelry is created with wire, sheet metal, various findings like stone settings, and in Jeni’s case often includes shell casings as well. Customers frequently send Jeni shell casings that they fired for a more personal and customized design. Many shells sent to Jeni have some sentimental value, although some customers simply enjoy having a piece of jewelry made from a shell that they fired. Each fabricated design will be completely unique because each one is individually crafted and variations will naturally occur. The majority of Jeni’s fabricated custom work consists of smaller projects that do not vary much in price from the fabricated items featured on jenuinelyjeni.com. These projects normally take one to two weeks, however the timing will vary based on the season. Occasionally Jeni is asked to create a more elaborate creation. The piece featured above is a custom wedding tiara created in sterling silver, with 9mm, 5.56, and 30-30 shell casings. It is set with 67 genuine gem stones including 65 blue topaz in Swiss, sky, and London blue, and two black diamonds set in cast eyes. Jeni especially enjoys projects like this that grant a tremendous amount of creativity given the amount of detail involved. This project did take about seven months to craft from the initial designing to completing fabrication. If you have a bigger project in mind, please allow plenty of time so Jeni can give your project the attention it deserves. Custom jewelry that requires model work must be hand carved in wax and molded. Carving a wax model is very, very time consuming, Jeni has been known to spend up to 100 hours carving a complex filigree model for her collection. The process is slow, but allows almost endless possibilities. After the wax model is carved a mold can be made. Having a mold is wonderful if you’d like to have additional pieces made. Cast custom jewelry may have some slight variations in the polish, as they are all finished by hand, however they will all be quite consistent. Due to the time and tooling involved in this process, the expense is in most cases higher than fabrication. If you would like Jeni to craft some unique custom jewelry for you please call 540-358-4324 or email Jeni for more information.